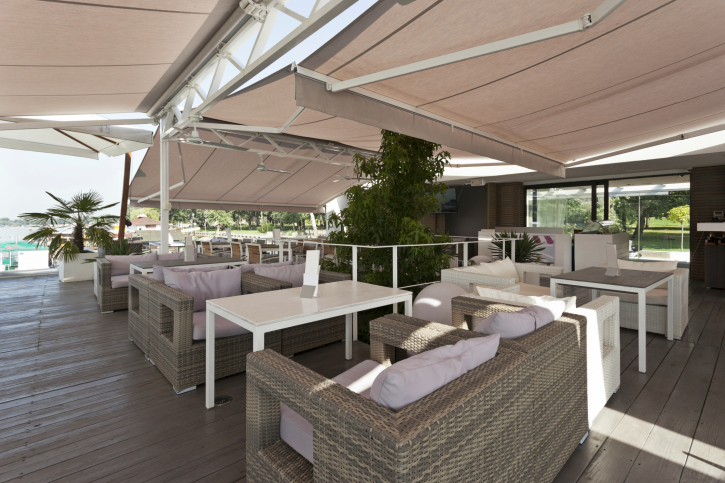 Adding an awning onto your restaurant will add curb appeal and room for more patrons to enjoy meal in the shade! Everyone in the restaurant industry knows that more tables mean more profit. So when thinking about adding more tables to your restaurant, think about purchasing a commercial awning for your restaurant’s patio. These awnings from Carroll Awning will provide your guests with several benefits that will ultimately lead you to a more profitable business. On the east coast, the weather can particularly unpredictable, especially in the summer. It can even change over the course of an evening inside a restaurant. So adding a patio awning will allow people to enjoy the sudden storms and also stay until the storm is over. When customers stay at a restaurant for any amount of time, they feel obligated to enjoy a beverage or perhaps a dessert after they have finished their meals. With the release of new heating and air conditioning equipment, your customers will be able to enjoy this outdoor seating area during every season. Your customers will love sitting outside in the comfort of the heaters while snow is falling a few feet away from their table. This unique experience is sure to draw crowds of new patrons as well as the “regulars.” Your customers will also be greeted with a shady dining experience in the height of the Maryland summer when the sun is scorching hot. This will let customers eat in peace and stay longer to enjoy a cool beverage and good conversations. The benefits of curb appeal are unlimited. But your awning can be used as more than one element of appeal. The first is your logo. With a freshly cleaned awning covering your patio with your logo splashed across it, customers will be enticed into coming to see what your business serves. The opportunity to advertise your business is almost limitless. Advertising your business on the awning isn’t the only way to promote your business. When you put your patrons on the patio, the smells of food wafting by and the sound of people having a good time will reach out to patrons. The smell of food will make them hungry and the sound of laughter will draw them into your restaurant for that good time they are looking for. These sights, sounds, and smells are what draw people out of their homes in the first place and they will be drawn to your business. The potential benefits of a commercial restaurant awning are limitless. Your guests and staff will enjoy the shade as you enjoy the sound of a happy crowd enjoying the food your restaurant has to offer!